It’s no secret that brownies are my favorite (and cookies, cake and pie). When I need a chocolate fix, and want to avoid baking, my car steers itself to Cutler’s. 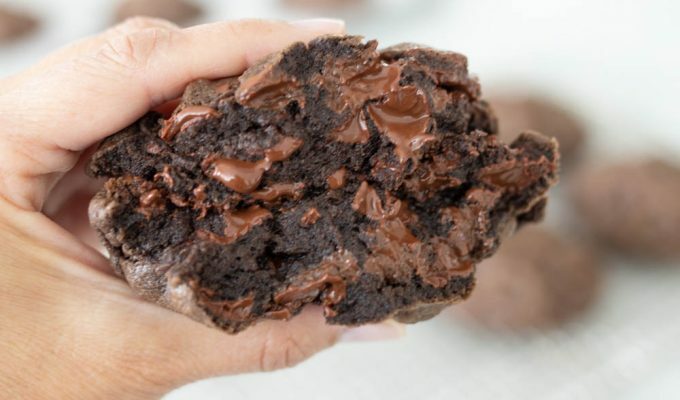 Cutler’s Brownie Marshmallow Cookies are a little bit of choco-marshmallow heaven on earth. Curt Cutler, the B-town Cookie King, taught a class at a South Fork recently. He’s always willing to share tips and tricks to making perfect cookies. Curt’s #1 tip? Using cake flour in all of his cookie recipes. When you are baking at a high altitude (we are at about 4,400 ft in Btown), adding additional flour or using cake flour is essential to produce cookies that look like cookies, and not pancakes. Another tip- Curt used to buy marshmallow creme until a little while back, when the supplier wasn’t able to deliver- he checked out a few recipes and started making his own. Oh my. So good. Simple too. Forget about that stuff in the tall glass jar at the grocery. Once you whip up Curt’s marshmallow creme, you’ll never look back. Trust me, you’ll love these cookies. done when top is slightly cracked and no longer looks wet. powdered sugar and beat on low speed until blended. Add vanilla and blend. May be frozen for later use. Spread cooled cookies with about 1 tablespoon of marshmallow creme. Top the creme with frosting. Try not to eat the whole batch before your kids get home from school. Oh I have not had these before! Time for another trip to Cutler's Cookies and then some time in the kitchen… Yum! AH!!!!! You can bet that I will be making these asap!!! Hi Barbi, We will resume classes in mid September, watch for the schedule in early September! For a marshmallow addict like me, this looks like heaven. Gosh I love this recipe. Brava! What size balls does the cookie dough need to be rolled into? Hi Corinne, The cookie scoop Cutler's uses is about a 2 inch scoop, I believe. This recipe yields about 18-24 cookies. Does this really use raw eggs for the marshmallow cremem? I'm preggo and a little paranoid about eating raw eggs. . .
Kaitie- Yes, the recipe calls for a raw egg white. If you are hesitant to use, just purchase a ready made marshmallow creme. This looks amazing! Does the flour measurement change if you aren't living at a high altitude? Should I still use cake flour? I get this cookie every time I go to Cutler's. I'm so glad to have a recipe to make it on my own now. Do you use unsweetened cocoa for the frosting as well? Growing up, my mom would always take us kids to Cutlers to get a brownie marshmallow cookie. Since I've moved out of state, Cutlers (and those irresistible cookies!) is one of the little things I really miss about Utah. Thank you so much for posting this recipe! I can't get enough of these cookies, and everybody I've shared it with in Washington and now Florida love it too (this cookie recipe is going to spread across the country like wildfire!). Thanks! Are you supposed to let the marshmallow creme set a little before adding the chocolate frosting? I had quite a mess on my hands when I tried this recipe! Do you have a recipe for Cutler’s Brownie Mint cookies? I would think the cookie part would be the same, but the mint instead of marshmallow. They. Are. SO. GOOD! Thanks so much Si and Curt, Cutlers has the best cookies hands down! Were you ever able to get the mint recipe!?!?! Hi Tracy, that might be one of my next projects. All of their cookies are just so delicious. Thanks for reading ABK! I LOVE these cookies. Thank you for sharing! How long do these stay good for? I have a family cookie exchange on Friday and I’d love to make these! What’s the best way to keep them good? Also, can they be frozen? These cookies are AWESOME! The homemade marshmallow is fabulous! Do you recommend keeping the cookies in the refrigerator since the marshmallow cream has raw eggs in them, or do you think they would be fine to store at room temperature? By the way, you are my all time favorite blogger to follow. I always know that any recipe I get from you will be an absolute winner! Thanks! Love every recipe you have! And thank you for reading ABK! I can’t wait to try these! I just tried cutlers cookies last month when I was in Utah after seeing you post about them. They are soo good! So I can’t wait to make these to hold me over until I go back to Utah. Do you ever do a post with the recipe for the mint chocolate brownie cookies? I wasn’t sure if I just missed it. If not I would definitely not complain if you did that recipe sometime 😀 thanks for all your yummy recipes!